Besten Dank für Ihre Bewertung von Salt and Sanctuary -US-. Falls Sie Ihre Meinung ändern, können Sie jederzeit Ihre Bewertung überschreiben, in dem Sie eine neue Stimme für dieses Produkt abgeben. A doomed sailor is shipwrecked on an uncharted island. In fog-shrouded valleys, where grinning, mossy corpses cling to rusted arms, shambling figures begin to stir. Beneath crumbling, salt-worn structures, labyrinthine passageways lead to unspeakable evil, long forgotten by man. Salt and Sanctuary: Drowned Tome Edition - For the very first time in physical form, Salt and Sanctuary fans may rejoice in the comprehensive Drowned Tome Edition. Included inside the Nintendo Switch game box is the game itself, a download code for the Salt and Sanctuary original soundtrack, The Sodden Knight poster, and the world map of The Island of Salt and Sanctuary. For the very first time in physical form, Salt and Sanctuary fans may rejoice in the comprehensive Drowned Tome Edition. Included inside the Nintendo Switch game box is the game itself, a download code for the Salt and Sanctuary original soundtrack, a double-sided poster of the Sodden Knight (side 1) and the world map of The Island of Salt and Sanctuary (side 2), and a 20 page manual. 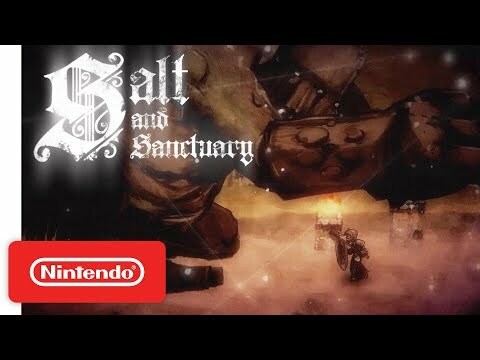 • Salt and Sanctuary seamlessly combines fast, brutal, and complex 2D combat with richly developed RPG mechanics. • Discover, craft, & upgrade over 600 weapons, armor pieces, spells, & items as you explore a cursed realm of forgotten cities, dungeons, desecrated monuments, & the fallen lords they once celebrated. • Explore a vast and treacherous world teeming with diabolical traps, mysterious secrets, hidden shortcuts and vicious enemies. • In addition to a diverse array of combat and platforming challenges, this seamlessly-interconnected environment features more than 20 powerful and devious bosses.